The U.S. enacted quota laws out of xenophobia and fears of immigrant "takeover" and depression of the economy. The Immigration Act of 1917 ( also referred to as the "Asian Exclusion Act") prohibited the immigration of people to the U.S. from Eastern Asia who were deamed "undesiarables". "Undesiarables" were people that were criminals, "idiots", insane, or alchoholics. This law was passed over the veto of president Woodrow Wilson and would be known as the first law to attempt to ban widespread immigration to the U.S. 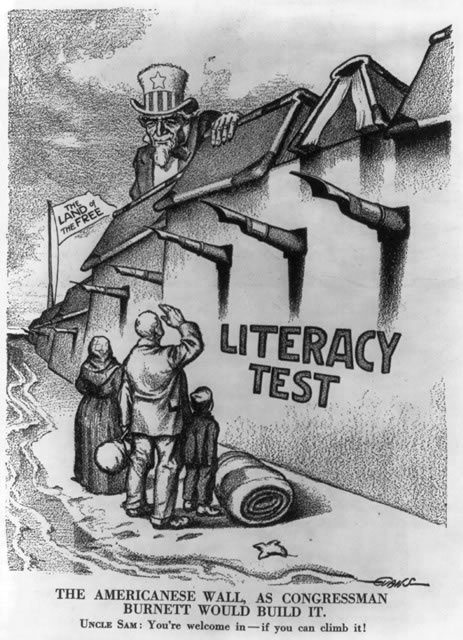 In addition to denying anyone access who they wanted, the government also implimented a literacy test that tested the "literacy" of immigrants by forcing them to read at least 40-50 words from a book to prove that they could read English. Also, an eight dollar head tax was placed on of every immigrant in a bold attemt to stop big families from immigrating to the U.S. With no real motive for implimenting this law, people can only speculate that it was passed out of pure racism against Asians. 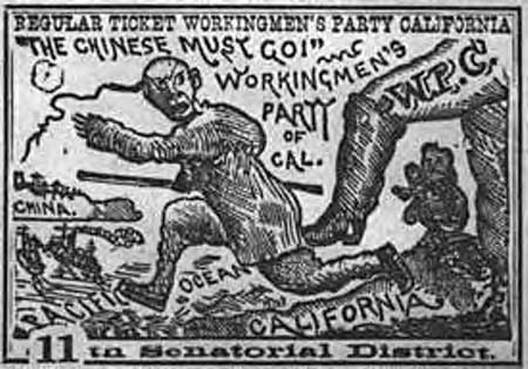 It may have even been an attempt to broaden the Chinese Exclusion Act to include all Asians. The Asian Exclusion Act was only the rough draft however of things to come. In contrast to the Immigration Act of 1917, the Immigration Act of 1921 (also known as the Emergency Quota Act) was passed by newly elected president Warren G. Harding with clear reasons. Between the years of 1920-1921, over 800,000 immigrants entered the U.S. The fear among Americans was that immigrants from Eastern Europe and Russia were Jewish, Bolshiveks, or other kinds of "radicals". The Red Scare proved that Americans thought that revolutions taking place in Europe could easily translate across American borders through immigrants. Americans also thought that a huge number of immigrants would depress wages. Also, fears erupted among the masses that these new immigrants would gain political power and take control of the U.S. government. These fears were recognized in Congress and thus the Immigration Act of 1921 was passed. This new law limited the total amount of people permitted to immigrate to the U.S. from each country to 3% of its total population. That meant that the total immigration to the U.S. could only be 357,000 people. People of certain professions were let in with little to no restriction however because of their possible benefit to the American economy. Also known as "The National Origins Act", the Immigration Act of 1924 was an expansion of the Immigration Act of 1921. This time, law makers in Washington didn't debate about removing the insane quota laws, but instead debated about how they could build on them and make them "better". This new immigration act set quotas based on the total number of foreign born people living in the U.S. in 1890! This was done primarily to lower the quotas from 3% to 2% of immigrants allowed into the U.S. 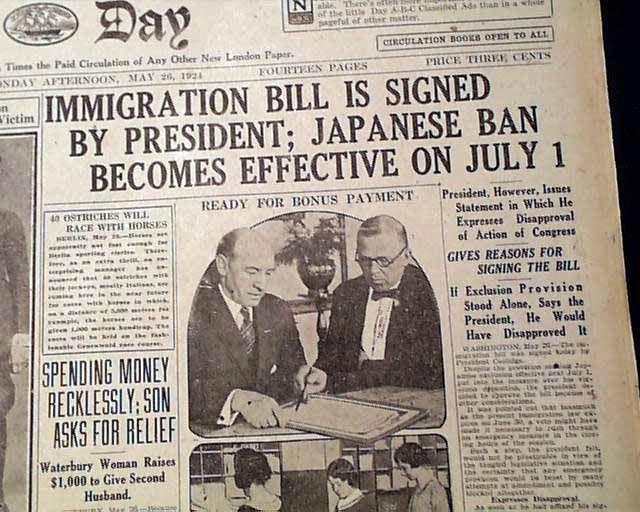 In addition to lowering the quota laws, this act barred the immigration of all Japanese into America. It was a clear violation of the Gentlemen's Agreement which said the Japanese would restrain their people from emigrating to the U.S. in large numbers. Western Europe wasn't effected by the quota laws however because the majority of emigrants coming into America from there were middle class citizens with money. I chose this topic because it was very briefly covered in my AP book and it was very interesting that it practically skipped over this very important part of American history. The part that I found most interesting about this is that the Immigration act of 1917 was passed over the veto of Woodrow Wilson. This relates to AP Human Geography because it shows America's history of extreme xenophobia, specificaly towards Asians. Also, the majority of Asian migrants came over to work in the primary and service industry. Some would save up enough money and return home (like guest workers) but the majority stayed. "." . N.p., n.d. Web. 28 May 2014.
n.d. Web. 29 May 2014. "Chinese Exclusion Acts of 1882 (corrected version)." YouTube. YouTube, n.d. Web. 29 May 2014.
to the US,. N.p., n.d. Web. 29 May 2014. "." . N.p., n.d. Web. 29 May 2014.